Vimeo download button might not working all the time, especially for the users without Vimeo account. So if you want to download any Vimeo videos for free and without limitations, you need a reliable Vimeo downloader. Below you will get 2 ways on how to download Vimeo videos and a top list of 5 Vimeo Video Downloader for Mac. Vimeo Downloader for Mac is the highly recommended Vimeo downloader to download any Vimeo videos for free. This Vimeo video downloader not only allows you to download videos from Vimeo, as well as other video sites like YouTube, Metacafe, DailyMotion, Facebook and 10,000+ other sites, but also convert Vimeo video to play on portable devices offline. You can also use it to record videos from Netflix, Hulu, iTunes, BBC iPlayer Live, Hollywood Video, and more. Better that Vimeo downloader online service, it can download batch videos at a time. The Vimeo downloader for Mac version can well support the new Mac OS X 10.14 (Mojave), 10.13 (High Sierra), 10.12 (macOS Sierra), 10.11 (EL Capitan), 10.9 (Mavericks) and 10.10 (Yosemite). Support downloading Vimeo videos in only a single click. Allow downloading Vimeo videos with only the video URL. Download videos from other 10,000+ sites like YouTube, Facebook, Vevo etc. Download Vimeo to MP4 and allow 1 click to download YouTube to MP3. Convert videos to any media formats like MOV, AVI, MP4, MP3, and more. Offer presets for a variety of mobile devices including iPhone and Android. See how to download Vimeo video with Vimeo video downloader for Mac (EL Capitan and Yosemite included) step by step, and convert to device compatible format in no time. First, download and install the Mac Vimeo Downloader. Make sure the corresponding download extension is installed to support your browser like Safari, Firefox and Chrome. Launch your browser, e.g. Safari, and go to Vimeo.com to find the video you want to download. When you play the video, a "Download" button will appear on the top left corner of the video. Click it to open iTube Studio to start downloading video from Vimeo.com. 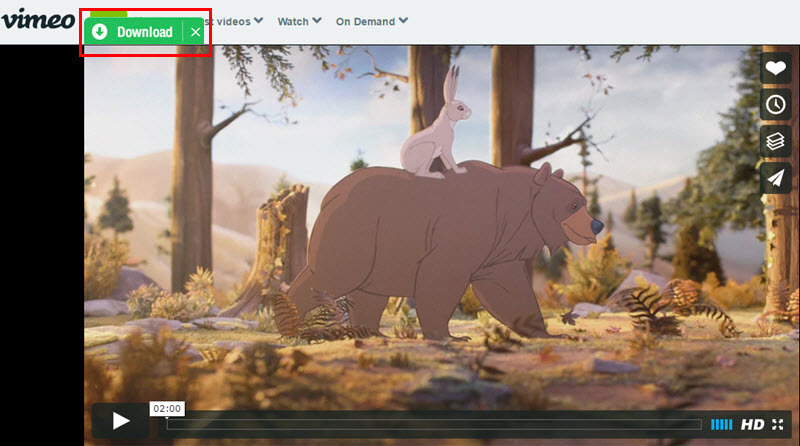 Other ways to download Vimeo video include: 1) Copy the URL of video page in browser, and go to the main interface, choose "Paste URL" to start downloading Vimeo video. 2) Directly drag and drop the URL to the dock icon of this Vimeo Downloader. To convert the downloaded video to play on device, in the "Download" menu click the "Add to Convert List" icon in "Downloaded" tab in order to send videos to "Convert" tab. Then you should navigate to "Convert" tab to start the conversion process. In "Convert" tab window, find the video you want to convert from the list, click "Convert" icon on the right hand. When the conversion appears, select a device preset. 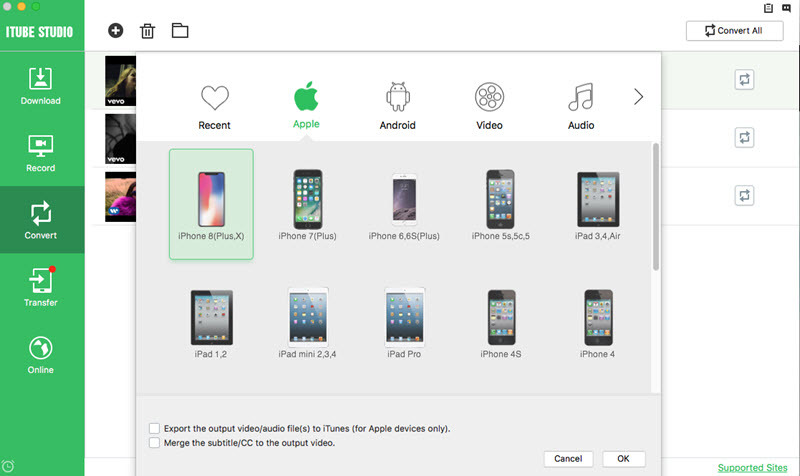 All popular devices are supported, including iPhone, iPod, iPad, PSP, Android, etc. Click "OK" and you're ready to get the compatible video for your selected device. If an Apple device is chosen, choose the "Export the output video/audio file(s) to iTunes" option. This way, the converted video will be added to iTunes library automatically so that you can simply connect to your Mac and sync to device with iTunes. If you have many other FLV/MP4 videos saved on your Mac, you can easily manage and convert these videos by adding them to the program video list first. Just go to the "Transfer" tab, click "Add" icon on the top of the window. Step 1. As shown below, locate the Download the button in the tool bar. 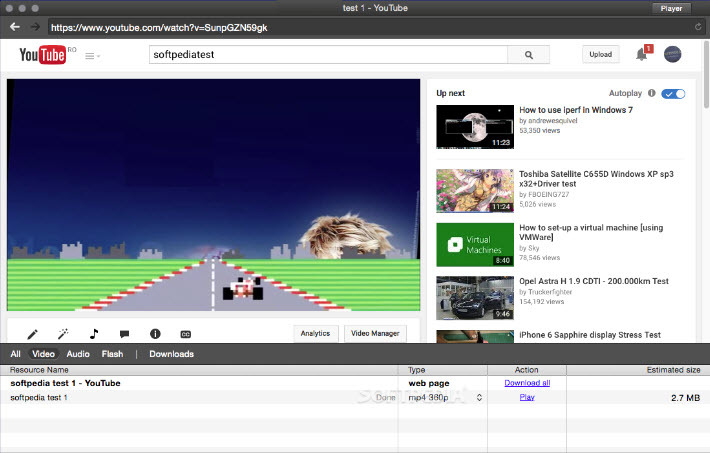 Click the Download button to expand options to download video in different size and resolution. Depends on the source, you can download FLV, MOV, or MP4 video from Vimeo. Step 2. To start downloading Vimeo video, don't click the video title. Instead, right click it and select "Download Linked File". The Vimeo video will be downloaded at the background. To view it, go to Window > Downloads, or simply press Option+Command+L. However, for those Vimeo video doesn't provide the Download button, you have to rely on third-party tools like iTube Studio for Mac to download Vimeo video on Mac. The owner has enabled it. The downloads doesn't reach at the maximum of 100 times per day. This is the limitation of Vimeo to save their bandwidth. Note that the quality of provided video will vary based on membeship account. Vimeo video owners with Basic accounts can make their original video available for up to one week for download. Then only the converted MP4 format is available. Plus users who have opted in to store their original videos can always allow others to download their original video files if they enable it. Although FLV, MOV and MP4 are supported by most portable devices, chances are that the resolution is too high for some devices. In such case, you need a video converter to turn Vimeo video compatible with your device. For example, Video Converter for Mac. It supports all popular devices, including iPhone/iPad/iPod, PSP, Zune, Xbox, etc. 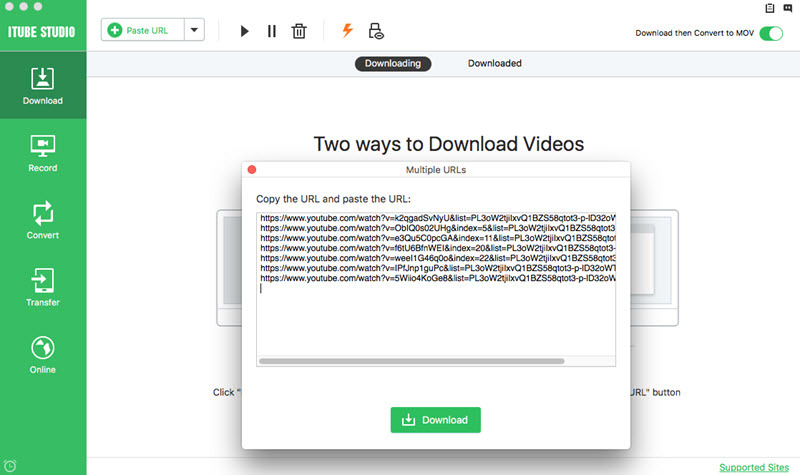 This free vimeo downloader for Mac is helpful to the users if they want to download vimeo videos straightforwardly and without delay. iOrgsoft’s Free Vimeo Downloader for Mac helps in saving any Vimeo video or HD Vimeo video freely on Mac version between 10.4-10.7. This software is able to download vimeo ASF, WMV, Flash, AVI, MOV, MPG videos on Mac. It contains built-in video player for vimeo videos’ playback ease. You can share videos to Facebook and Twitter with a single click immediately. 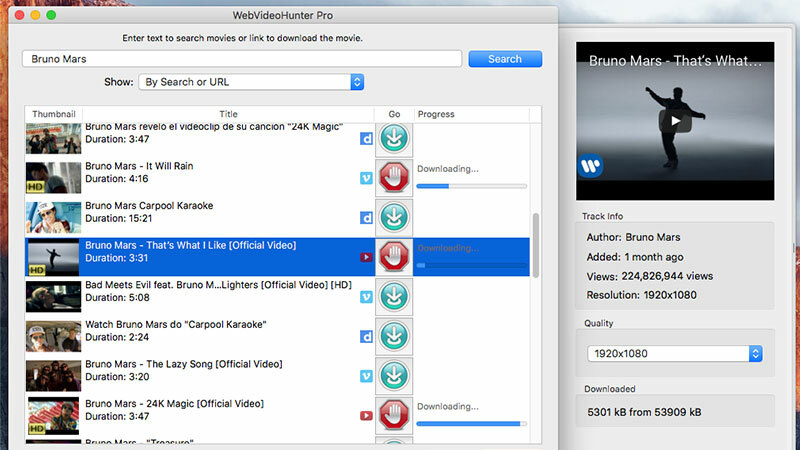 YouTubeHunter is an additional vimeo downloader for Mac. The app helps when you want to know how to download vimeo videos on Mac and gets download vimeo and YouTube videos to the Mac. 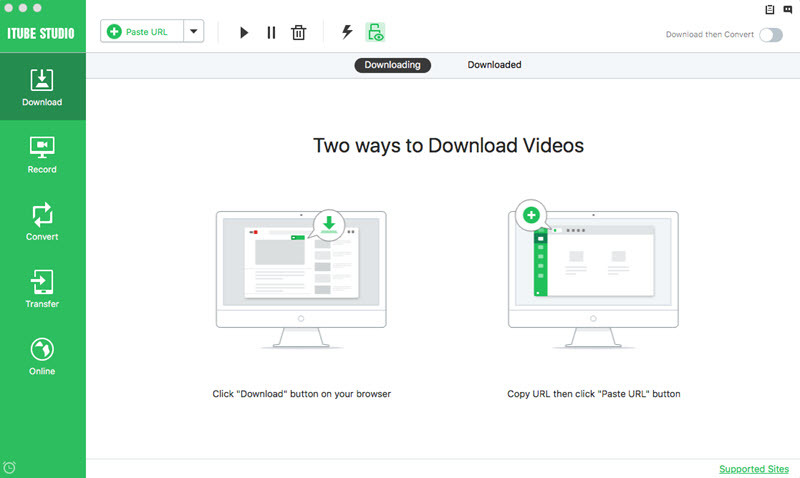 This vimeo downloader helps to download video from vimeo on Mac as well as download from YouTube and many other video resources. The user can classify the videos according to the most viewed, most popular, popular in HD, latest etc. The software enables the user to decide whether he/she wants to download all the video or merely the audio. This is handy when the users need only the soundtrack of the video. 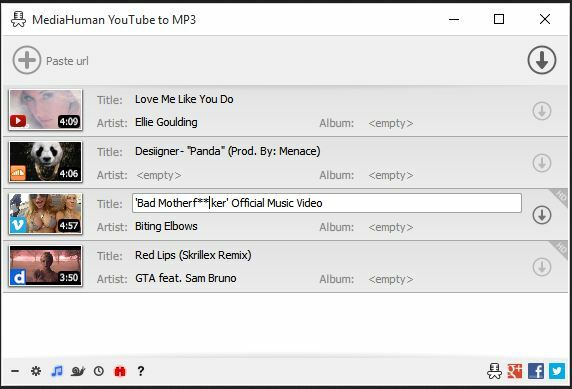 Mediahuman YouTube to mp3 converter is a very good Vdownloader alternative to download mp3 songs. As its name says that it is a convert which can convert videos to mp3 directly. Download videos in high quality mp3 formats. Available for mostly every operating system. Supports 20+ videos sites to extract audio. 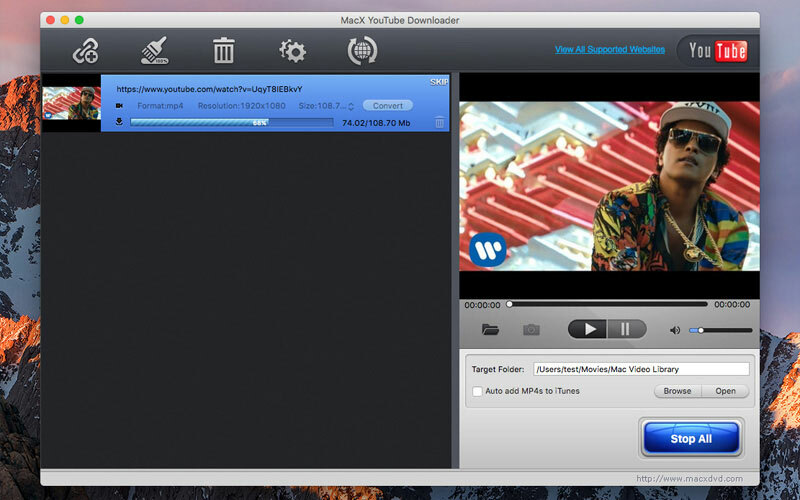 MacX YouTube downloader is another vimeo downloader for Mac. The name says YouTube but the user can download videos from vimeo, Dailymotion, Vevo and a wide range of video websites. 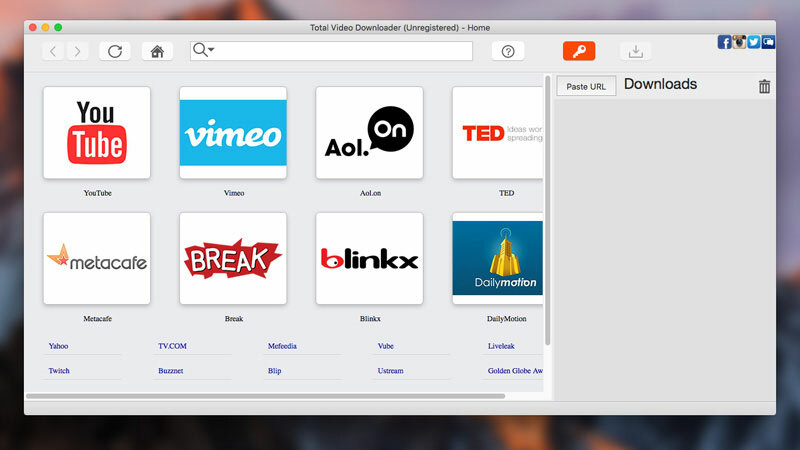 This software lets the user to download vimeo videos on Mac in various resolutions and formats. This software supports more than 300 video sharing sites. Along with video downloading, MacX supports audio downloading as well. It benefits the users with its built-in video player. 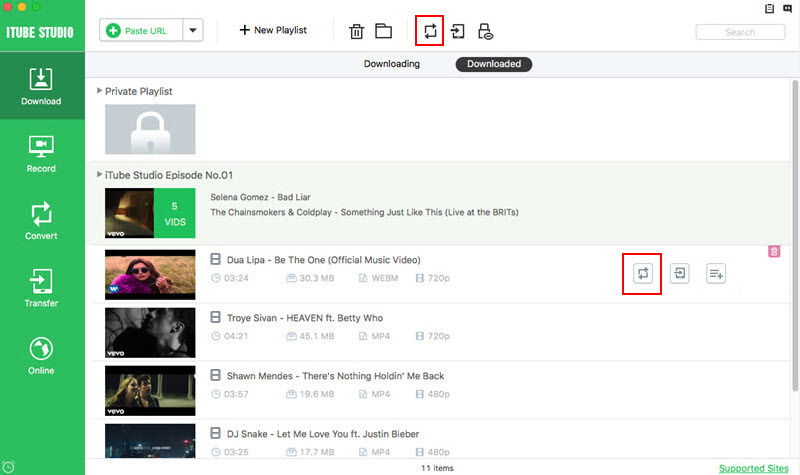 Also, it enables to download videos on batches. To download vimeo videos on Mac, Total Video Downloader is another option for the users. This software offers different resolution and formats. It has now its upgraded version and gives ultra-fast speed too. This vimeo downloader for Mac supports batch downloading option. The software has user-friendly interface and one can navigate easily. It supports various video web portals. Hope the readers are now aware with some good vimeo downloaders for Mac and could decide which will work according to their requirement. But if they’re still in confusion, they can use iTube Studio without any uncertainties. Although all the software has their some good sides as compared to others, iTube Studio stands exceptionally well as a vimeo downloader for Mac for everything positive in it. Being able to download from 10000+ sites, one can’t ask for more! Vimeo is one among the most visited online video sharing websites. Founded back in 2004, the video sharing service quickly becomes very popular among users all over the world. With more than 14 million registered users and 85 million audiences using the service each month, Vimeo is one of the biggest creative networks on the internet. Vimeo's motto is to motivate and to inspire people all over the world to create videos and to share them with others. 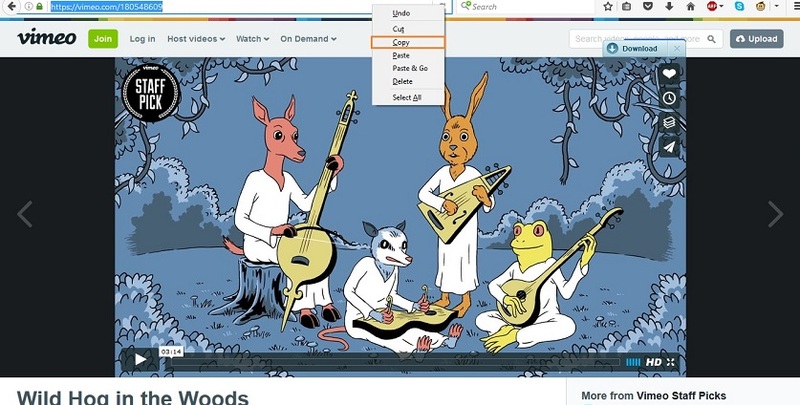 Vimeo enables a Download button on some of the videos for viewers to download. However, if you are the viewer or without a Vimeo account, you are not able to download the original videos and the videos without permission. For Plus and PRO members on Vimeo, you might download original videos and some other videos that allow dowloading, while you need to pay high subscription fee every month to Vimeo. So to get a powerful Vimeo downloader, you can download videos from Vimeo anytime you want. Anyone who wants to become a member on Vimeo can go for any of the 3 membership options available. The Basic account is totally free to use but has some limitations - you can upload only 500mb of video in a given week. The Plus account is suitable for you if you produce / shoot lots of videos. With Vimeo Plus account, you can upload 5GB of videos per week. That means you will get all the videos backed up on the Internet in HD quality. The Plus account costs $9.95 per month. If you are creative professional or looking for the best video-sharing service for commercial purposes, Vimeo Pro could be the right choice for you. With the Pro version, Vimeo offers your 100x more storage (50 GB) per week when compared to Basic version. The Pro membership costs $199 per year and gives you access to more features. The 'Video File' feature is one of the main reasons why millions of people on the Internet use Vimeo day in and day out. You can access the 'Video File' option by clicking the settings button under any of your videos. You can delete or enhance or completely replace your video. With the enhancer you will be able to add copyright free music and to some extent enhance the visual appeal of your videos. Want to replace your old video with a new one? Click on the 'Replace this video' and you can upload a new video and replace the old one. The best part is, you can still keep all the comments, tags, likes etc. and also retain the URL and video clip ID. Is It Possible to Convert Vimeo Videos to Music?